Tweet I decided a couple of weeks ago that I wanted to take up some form of painting again. It's been years since I did any proper painting, not since my art A Level, in fact, aside from some low level digital painting. I knew I wanted to try to master digital painting, but I also wanted to try a more traditional form. I was torn between oils and watercolours - I'd done oils at school but knew they were both messy and expensive, while watercolours were far more readily available. So far, I've just really been practicing with washes, colour mixing, and different techniques, but I did want to try and paint something recognisable, instead of just page after page of meaningless colour. This was one of my first attempts. It was really rather simple. I began with a graded blue wash, simply adding more water to dilute the colour, to make the sky lighter as it approached the horizon, and then dried my brush in order to apply the blue paint for the water using the dry brush technique. The resulting white patches among the lines resemble light on water. Once the sky and water were dry, I then used a much finer brush to sketch in the boat using dark brown. 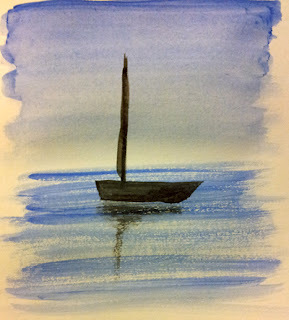 When it was dry, I added another layer to give a shadow and sense of depth to the hull and mast. Again I used the dry brush technique to add a reflection in the water. All in all, I'm pretty pleased with it - it's not exactly going to blow the minds of the art world but it's simple and recognisable! 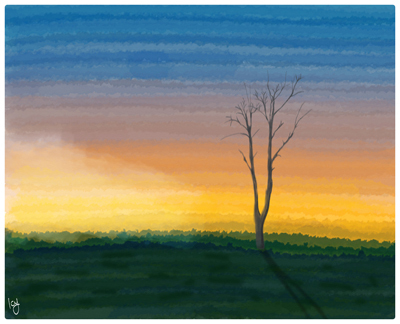 As for my attempts at digital painting, I loaded up Photoshop CS5, plugged in a Wacom Bamboo, and had a go. I started off by actually tracing the tree outline from a photograph, and just added shadow by going over the areas several times. Then I created several background layers, altered different brush settings in the Wet Media brush set, and created a graded sky by sampling colours from a photograph of a sunset. I was quite pleased with the stipling on the grass, and the blending of the sky, although the white cloud effect doesn't work. All in all, I think I may give digital painting another go!